Flobot Field Quoting App is designed for contractors, field service companies, sales people and estimators to create an on-site estimate instantly. Now you can quantify material, labour, waste disposal, parking, congestion charges, subcontract and any other costs needed to build a comprehensive quote for your customer. 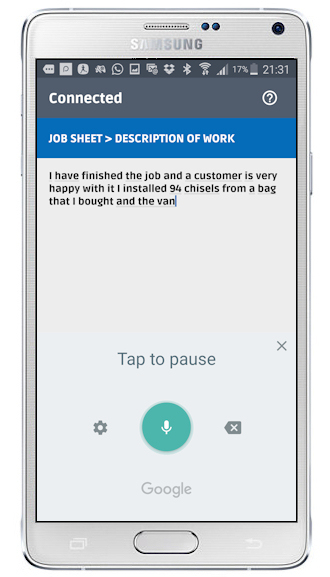 This mobile quoting app does all the calculations and builds up an itemised estimate, adds on VAT or sales tax and sends it instantly to the customer on email. Upload a price list for parts and labour or it will remember the prices you use for another time. It can accept multiple templates so you never have to type out a description of the work proposed again. You can leave notes about the project, pictures and measurements that you don't have to share with the customer. You can hide the prices and line items too if you wish. It is probably the easiest to use, most flexible mobile estimation tool on the market and it is available for Apple and Android devices. Brilliant for landscape quotes, cleaning quotations, flooring quotes, boiler quotes, electrical estimation projects, handyman jobs, refurbishment and construction estimates. Build a quote or estimate instantly while still on the customer premises. Send it to them directly or upload to the system for later. The prices are prefilled to save time. Either upload a price list for parts, labour, fitting rates etc or build one as you go along. Whether you want to share them with the client or not they are useful on a quote to remind yourself or maybe show another contractor what to do. Create multiple templates with description of the most common types of jobs you do. Easily swap them depending on what the estimate is for. Can't get a connection? Don't panic. Flobot stores the quote on your phone so you will be able create a quote even when you can't get a 3G or 4G signal. And when you do get one, it will sync with the server automatically and send the quote back to the office - or to the customer. Once you have built the quote you can instantly turn it into a project sheet for a contractor to follow and create a supplier order sheet and instantly send it off to your supplier to make an order for the parts and materials on it.